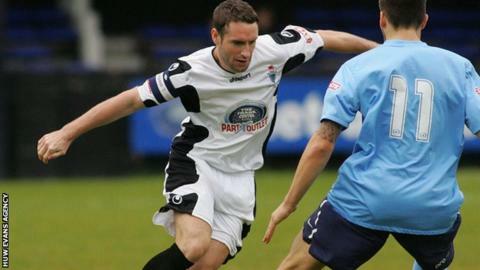 Captain Steve Williams says securing automatic promotion from the South and West Division is out of Merthyr Town's hands. Merthyr need three points against Thatcham Town on Saturday and need leaders Cirencester Town to slip up. Merthyr are guaranteed second place whatever happens and will be at home in the play-off semi-final and final. We are still there and can get automatic promotion but now we are relying other teams - Cirencester to slip up. "Fingers crossed, we just have to get three points and we will see how it goes after that," said Williams. The Martyrs are unbeaten at home this season and are faced with the play-offs for a second successive season. They were beaten 3-1 in extra-time by Hungerford in last year's play-off final. Merthyr were top of the league for most of this campaign despite having to play their 'home' fixtures at Cinderford Town over the first half of this season while a new 3G synthetic pitch was laid at their own Penydarren Park home. But a run of one win in four games has seen them lose their grip on the title. "It is bitterly disappointing that we haven't been able to keep up the good form," said Williams. "We are still there and can get automatic promotion but now we are relying other teams , Cirencester to slip up. The Martyrs won two successive titles and back-to-back promotions going into last season. If they are promoted they will be back to where they were before folding because of financial problems.